In last month’s blog on Restoring Musical Classics we began with the announcement of the upcoming availability of several of our newly restored musicals along with a brief explanation of what musical restorations are and why they are necessary. Essentially, the assumption, that the script and score materials licensed to recreate Broadway musicals are faithful to their original Broadway productions, is not necessarily a true one. Due to the last minute panic of getting any musical on its feet, especially a new one, the original scripts and scores and orchestra parts, certainly in the days before Xerox and Finale, became a maze of cuts and arrows and new words and notes scribbled in with others scribbled out. Months, or sometimes years after a show closed, a music copyist (almost always without the benefit of a corrected full orchestra score) would despair as he tried to make sense of the chaos on the pages in front of him. An educated guess would be made and something the composer intended was forever lost. Conversely, something that was never meant to be heard was reinstated for all time. Luckily for us, computer programs are now available that make the puzzle of reconstructing original orchestrations and vocal arrangements far more achievable than it has ever been. But even with high tech helping, the job of deciphering chaotic and often incomplete materials is still problematic, and each show brings with it its own unique challenges. In THE KING AND I, for example, Trude Rittmann, dance and choral arranger extraordinaire, was responsible for the musical arrangement of the second act ballet, “The Small House of Uncle Thomas”. 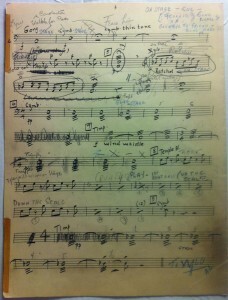 Her manuscript carefully details the rhythms that the brilliant Jerome Robbins required for his choreography. It was Robbins’ idea that the percussion part would be performed by both an on-stage player and the percussionist in the orchestra pit. But when orchestrator Robert Russell Bennett began his instrumentation, Robbins (with the assistance of dance arranger Rittmann) was still changing his rhythmic ideas. Even once the ballet was fully orchestrated and copied Robbins was asking for changes in both the on-stage and pit percussion parts. By the time the show opened, both percussion players knew what they were doing, but the parts they were playing from were practically unreadable. A few years later, when the show closed and the parts were recopied for stock and amateur licensing, the music copyist did his best to make sense of what he was given to copy. But for years the working out of the percussion parts for this ballet continued to vex generations of choreographers, conductors and percussion players – on stage and off. TOO MANY GIRLS, Rodgers & Hart’s college musical (the one that introduced the song “I Didn’t Know What Time It Was” as well as a nineteen year old Desi Arnaz) posed a different kind of problem. 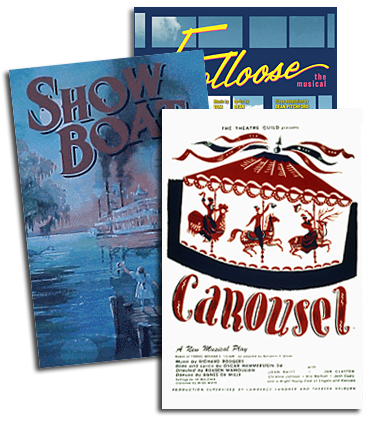 We had full orchestra scores, but the single set of parts from the original 1939 Broadway production had been reused for both the national tour of the show and a reworking of the original material at the St. Louis Municipal Opera (now the MUNY.) There were three sets of corrections on every page, and it became a major sleuthing mission to try to figure out which set of corrections were those which truly defined the intentions of the score. We had Hugh Martin’s amazing vocal arrangements and Hans Spialek’s brilliant orchestrations, but often the harmonies in the orchestra didn’t manage those in the vocal parts. What had actually transpired on Broadway? And which was correct – the vocal parts or the instrumental parts? Notes in margins indicate that Desi sang at least two of his numbers in Spanish, but no Spanish translations have been found. And the second act opening was orchestrated, copied and performed in a key so low we find it difficult to believe the female ensemble could actually have navigated it. But, if we are to believe what our eyes tell us, they certainly seem to have done just that. For FACE THE MUSIC, we faced a show for which no full orchestra scores have been found. So the entire score was reconstructed from the orchestra parts. However, these parts had been totally revised for the national tour that followed the Broadway run. And composer, Irving Berlin, had asked for several changes to be made. On many pages of the only existing set of orchestra parts new measures were pasted over old material that was no longer viewable. The Overture would have been impossible to bring back to its original Broadway luster had we not been able to find several of its tampered with sections in unfettered condition in other places in the score. (In those days many orchestrators would begin their work on a show by orchestrating four or five “utility” arrangements of what were perceived to be the probable song hits of the show. These were scored so they could quickly be interpolated as dance, scene change, underscore or any other kind of music that might suddenly needed throughout the show.) Often an Overture or an Entr’acte could be quickly produced by assembling a collection of these utilities with the orchestrator having to only provide new material for the introduction, the transitions and the coda. OKLAHOMA! had it its own set of peculiarities which had to be dealt with. There were no original parts. In fact, for the last fifty years there seems to have been only one set of parts in existence for OKLAHOMA! These were recopied sometime in the early 1960s, and everything that came before them now seems to have been destroyed. Luckily, Robert Russell Bennett’s original full orchestra scores still exist. And although many of the orchestra parts contain contradictory articulations, bowings, breath marks, dynamics, etc. the first violin part looks to have been copied from a particularly well edited original. So, for the first time, in our new restoration, the articulations, bowings, breath marks, dynamics, etc. will not be contradicting each other. And all of the missing harp material as well as the mistakenly removed second violin parts are being reinstated. This new edition will be premiered by John Mauceri at the North Carolina School of the Arts later this year and is scheduled to be released soon after that. Did I mention that the existing original full scores for Jerome Kern and Oscar Hammerstein’s MUSIC IN THE AIR specify an instrumentation much larger than the one that actually ended up playing the show when it opened in New York in 1932? Why? What happened? We were lucky enough to find the parts used for the show’s London debut, which occurred the following year. These retain the full orchestration and have helped us reconstruct material for which no full scores exist. According to Robert Russell Bennett’s notes in the margins the scores that survive, the original orchestra seems to have been reduced while the show was trying out in Philadelphia, just days prior to the New York opening. It’s almost unthinkable that, with everything else that was going on, Bennett had time to so alter his original instrumentation, shrinking his woodwind and brass sections by almost half and retooling a complicated and fascinating two piano part for a single player. Not to worry. Our new edition contains all of Bennett’s original work, and it is glorious to hear. In fact, of all of the restorations I’ve worked on over the last sixteen years, this is the one I most hope we get to record some day. Next week, we’ll devote the final chapter of this three part exploration of restorations to PIPE DREAM. PIPE DREAM may be the Rodgers & Hammerstein show that you know the least about. It lacked both the gravitas and the hit songs of the R & H smashes that preceded it. What it had was Helen Traubel, the Metropolitan Opera’s reining Wagnerian Diva, making her Broadway debut as the madam of a house of ill repute. But Ms. Traubel was not happy with PIPE DREAM, and PIPE DREAM was not happy with Ms. Traubel. And that was just the beginning. Looking forward to part three - Ms Traubel singing on the OBC recording of PIPE DREAM is one of my favourite things!